This is the ninth post in a weekly series highlighting Italy’s four World Cup wins from qualifications to the finals. Read the eighth post here. The afternoon of July 8th saw Italy face Poland at the Camp Nou in Barcelona in front of 50,000 fans, a very pro-Italian crowd. Referee Juan Cardellino de San Vicente of Uruguay called the match in nearly 90°F temperatures and gave three yellows to Poland and one to Italy in total. Poland were without their star striker, Boniek, due to yellow card accumulation, but Italy were without Gentile, their star defender, for the same reason. So it became a question of which nation brought a star and which nation brought a team. Rossi gave an indication of which country was which in the 22nd when he scored a header on an Antognoni free kick. Antognoni was subsequently injured in the 28th going for a loose ball and had to be subbed off. But it didn’t stop Rossi for accentuating his point in the 73rd minute with another header from a Conti cross, giving him a total of five goals in the tournament and giving Italy the win, 2-0. A team effort defeating the team missing their one star. 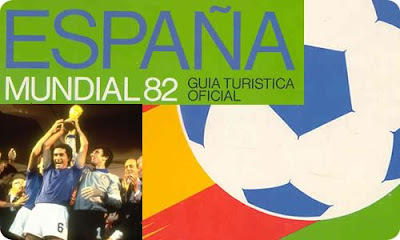 The other semifinal was held that night at Estadio Ramón Sánchez Pizjuán in Seville in front of a crowd of 70,000. 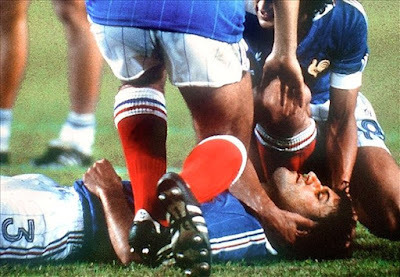 West Germany faced France in a match that would become notorious for perhaps the worst foul never penalized in a World Cup Match and the first time a penalty shoot-out was used as a tiebreaker in a World Cup Match. Dutch referee Charles Corver made no call at all when West German keeper Shumacher came brutally into Battiston feet first, leaving the latter unconscious and with a few less teeth. In fact, he slipped into a coma and had damaged vertebrae, too. Keep in mind that had Schumacher been shown the red card as most officials would have, he would not have been available to face Italy in the final… But in a game that still makes French fans (and many people, for that matter) queasy, West Germany advanced to the final on penalties, 5-4. The third place match was held July 10 at the Estadio José Rico Pérez in Alicante before a crowd of 28,000. Poland faced France in a match officiated by Jose Antonio Garrido of Spain, and Poland’s 3-2 victory over an exhausted and emotionally defeated France was their best World Cup finish. The final was held on July 11th in front of 90,000 fans at the Estadio Santiago Bernabeu in Madrid and was officiated by Brazilian Arnaldo Coelho. 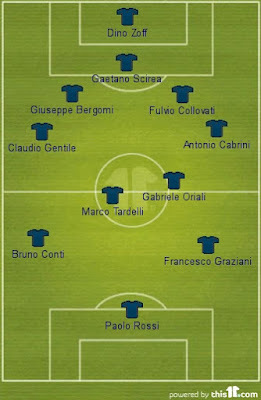 Italy faced the West German side in Italy’s fourth final, having won in ’34 and ’38 and lost in 1970. The match was off to an interesting start in the first half when Graziani was injured in the seventh minute and had to be subbed off for Altobelli. Next, a West German player tried to clothesline Conti in the area, and Italy were given a penalty. Cabrini stepped up to take it and shot wide, having the notorious distinction of being the first penalty miss in a World Cup Final match. Bruno Conti was cautioned in the 31st, but the excitement would be saved for the second half, thus the first half ended scoreless. But Gentile and Rossi assured the second half would get off to a better start. On a quick restart, Gentile crossed it to Rossi who scored in the 57th minute, his third straight game with one or more goals. 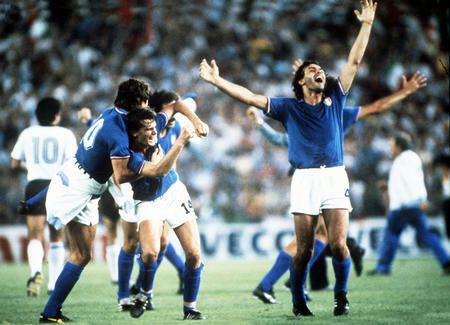 Not to rest on a single goal, two minutes later Tardelli, not usually a finisher, scored to put Italy up 2-0. His subsequent celebration became iconic for its display of pure joy, and a video clip of it was used for many years on ABC’s Wide World of Sports intro. As is common at this point in a match, tensions started to peak, with West Germany’s Dremmler receiving a yellow card in the 61st minute, and was then was subbed off in the 62nd for Hrubesch. 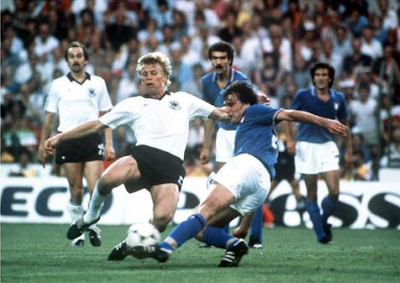 In the 70th, Rummenigge was subbed off for Muller, and the 73rd minute saw both West German Stielke and Italy’s Oriali cautioned. Catenaccio was not in the Azzurri’s vocabulary on this day. Having come from the bottom of the barrel, they wanted to ensure they reached the peak, no mistakes. So in the 81st, Altobelli scored from a play that saw Conti sprint down the side unmarked. Sandro Pertini, the then FIGC president was caught on video wagging his finger as if to show West Germany there would be no catching the Azzurri after that. Which would have been difficult for sure, being down by 3-0 in the 81st. 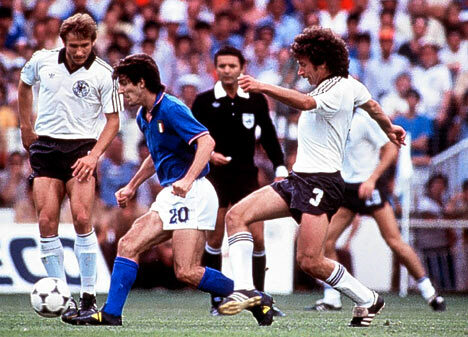 But if West Germany were defeated, they still fought back, with Breitner scoring a goal in the 83rd. The 88th minute saw Littbarski cautioned, with the 7th minute sub Altobelli being subbed off for injury in the 89th and Causio taking his place for the waning minutes. Unfortunately for West Germany, though, merely fighting back does not equal winning, and the Azzurri held on to win 3-1, reclaiming the title after a 44 year break. 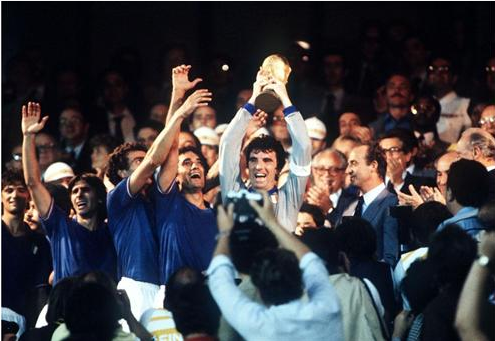 The quiet captain Dino Zoff lifted the trophy, which meant Italy had equaled Brazil’s three World titles. Zoff and his teammates then took a victory lap around the track and celebrated a very hard fought, unexpected, and deserved victory. Paolo Rossi won the Golden Boot with six goals, and was also awarded the very first Golden Ball trophy in World Cup history. Despite Italy having only twelve goals in seven matches, a new low for average goals per game for a World Cup winner and also a record low aggregate goal difference of plus six (both records finally equaled by Spain in 2010,) Italy were world champions again. This is part nine of a 12 week series I originally wrote for the now defunct Italy World Cup Blog five years ago. 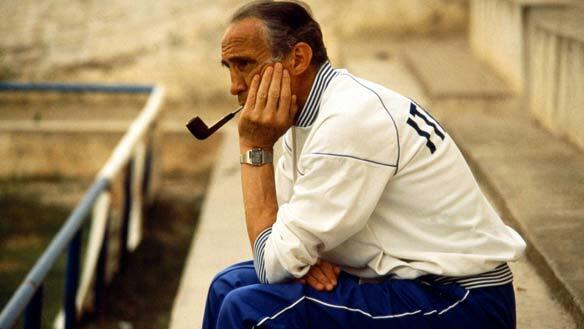 The series will now appear here weekly as a tribute to the Azzurri teams of the past.